SGL Group – The Carbon Company is one for the world’s leading manufacturers of carbon based products, manufactures flexible graphite foils and graphite sealing sheets from high quality expanded graphite and marketed under the Sigraflex® trademark to the sealing industry worldwide. With graphite purity more than 98% and sulphur content less than 300ppm, making Sigraflex® flexible graphite foil be the first choice for sealing applications for long term use at high temperatures – particularly in the petrochemical industry. Our Sigraflex® APX2, APX, E, C and Z foils feature outstanding oxidation resistance in comparison with other industrial graphite foils, making them ideal for high-temperature processes. Sigraflex® Hochdruck is a multilayer high-strength graphite sealing sheet, comprising of 0.5mm thick layers of high purity graphite foil and 0.05mm thick stainless steel foils. Several layers of graphite and stainless steel foil are joined together in a special adhesive-free process. As a result, the sheets have outstanding mechanical properties i.e. for operating pressures from vacuum up to 250 bar. While Sigraflex® Hochdruck Pro is an option for TA Luft application, and Sigraflex® APX2 Hochdruck (using highly oxidation resistant APX2 flexible graphite) for high-temperature applications. 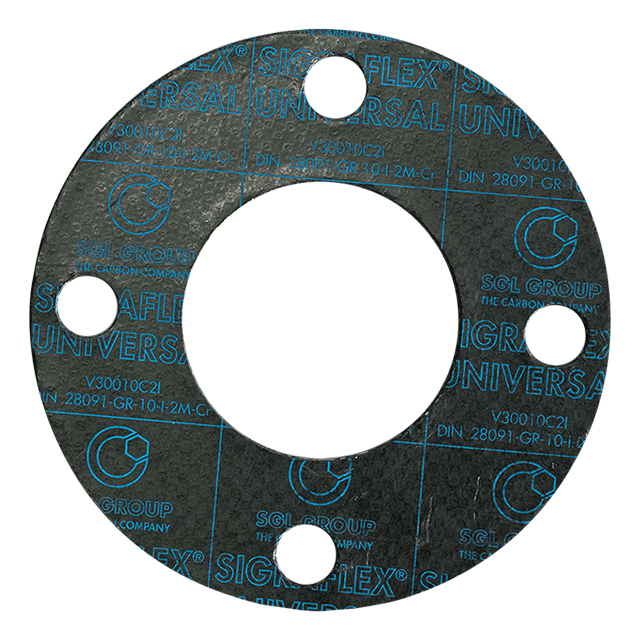 Sigraflex® Universal is an adhesive-free graphite sealing sheet made from flexible graphite foil with one or two tanged stainless steel reinforcements. The sealing sheet is impregnated to reduce leakage and improve handling. Temperatures range from -250°C up to 550°C, and operating pressures from vacuum up to 100 bar. While Sigraflex® Universal Pro is an impregnated Technical Guidelines on Air Quality Control (TA Luft) compliant flexible graphite sheet which highly recommended for TA Luft applications. Sigraflex® Economy is a bonded sealing sheet made from flexible graphite foil with one or two 0.05mm thick stainless steel foil reinforcements. Sigraflex® Economy has operating temperatures range from -250°C up to 550°C, and operating pressures from vacuum up to 40 bar. Sigraflex® Standard is a non-reinforced graphite sheet made from high quality flexible graphite with sulphur and chloride content less than 300 and 25 ppm, respectively. The sealing sheet is impregnated to reduce leakage and improve handling.